Last weekend Nutmeg turned 5, and today we visited the elementary school where she'll be going next year and met the teachers. Pebbles, not to be outdone, used her potty chair for the first time ever last night. All these events went smashingly, except for the emotional vertigo of realizing that my BABIES are growing up. And never mind that I'm about to get a whole new one; there is now incontrovertible evidence that THAT baby is just going to grow up too. It's a pandemic. Even the new baby is giving me a little whiplash, because look, my last pregnancy ever is alreayd 3/4 over. While I'm not sad that this is the last time I'll feel tiny feet systematically stretching out the cartilage of my rib cage (yes, this feels as bad as it sounds), it is sad to think this is the last time I will feel a little person rolling around inside me. 1) Nutmeg's party. We managed to not take a single photograph. The one above is from brunch the next day with my parents and grandparents. That photo fail thing will happen when you're busy baking two birthday cakes (my grandma's 80th was the next day), cleaning your house so it will look presentable during the 90 seconds the other parents see it while dropping off, cutting out and hanging 49 paper butterflies (that was Epu's job; if I had done it the kids would have thought we were having an amoeba party), and wondering really hard what you are going to do with 10 little girls while it pours buckets outside and your previously scheduled plans had included the sprinkler, blowing bubbles and the little jump house. Oh, and also that will happen when you're chasing 10 little girls around the house, preventing them from bashing one another with the pinata stick, and making sure you are the model party host mom in front of the one mom who stays the whole time. Despite the lack of photo evidence, Nutmeg turned 5 all the same and loved her party. And I can report that her friends are delightful little girls. Too bad none of them will be going to kindergarten with her next year -- they are all going to different elementaries. This morning we had the opportunity to visit two of the five kindergarten classrooms at our local school and meet four of the teachers. Not sure where they put all those kindergarteners during that time. Nutmeg immediately saw some books laid out on a table and settled right down to read one. Eventually, once the last page was turned, I convinced her to explore the rest of the room too. Both the rooms were pleasant and interesting, with lots of interesting materials everywhere. The teachers were all nice and welcoming and seemed to know what they were talking about. The whole experience calmed a lot of my worries about next year. I could see that Nutmeg was interested and engaged by plenty of the activities available there, despite the fact that she is already reading chapter books and some of the activities involved learning to read words such as "a" and "the." For instance, there was a fishing game -- and I remember playing this EXACT game in kindergarten -- where they picked up word-bearing fish with a magnet on a line. The teacher said that the kids could keep the fish if they could read the words on them. Nutmeg ignored that part, but had a great time catching as many fish as she could. When I mentioned that she could only keep them if she could read the words, she said, dismissively, "Yeah, I can read all those." But she wasn't like, "This game is stupid!" She loved the motor skills component of it. I also saw that the kindergarteners had papers they had written up on the wall, and that is an area that Nutmeg will need plenty of work on. She can make her letters, but most times, she is quite resistant to trying to write words. 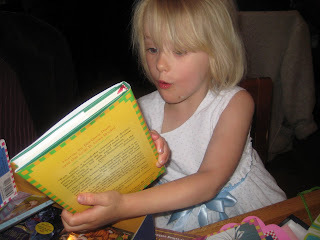 She was the same way with reading at first, so I would not be surprised if one of these days she is writing fluently. But she will need some practice and coaching on forming her letters more legibly. All the schools in our town use the Handwriting Without Tears curriculum, which I think is totally neat since it involves a little slate much like the one Laura and Mary Ingalls would have shared in their one-room schoolhouse. However, my kid will have her slate handed out to her by the teacher, instead of buying one for a penny in town on her way to school. And speaking of walking a couple miles to school, barefoot, and following the wagon tracks, I got the chance to ask one of my most burning questions about school: When do I get to kick her out the front door to walk her own self down there? One of the K teachers used to teach first, and she said that SOME of the first graders walk to school without parents if they have older friends from their block to walk with. I was glad to hear that. Even though personally I feel like Nutmeg should certainly be able to walk the two lousy blocks with a friend of her own age, I'll take it. We have lots of older kids on the block and if their parents EVER stop walking them to school maybe Nutmeg can tag along. 3. Peepee in the potty! I think potty training a younger sibling will be WAAAY different than training Nutmeg was. Because last night, when Pebbles finally managed to deposit a cc or two of pee into her potty chair, Nutmeg was just as excited as Pebbles was. We both danced around and high-fived her, and that got Pebbles doing a little happy dance. I had promised Pebbles candy if she went in the potty, but since we had JUST returned from getting ice cream cones and had then brushed teeth, I was happy she settled for watching Nutmeg's jewelry box ballerina do a command performance just for her. Unfortunately, when I asked Pebbles today if she'd like to go on the potty, she answered, "Already did." Sigh. We'll get there, though, because I would like to enforce the one-child policy in this house. That is, the one child in diapers at a time policy. yay pebbles! and happy birthday nutmeg!